Part of the richness of the Linux ecosystem derives from a robust offering of variants — called distributions — that focus specific combinations of under-the-hood architecture with defined sets of tools. Different distributions offer different blends of features. Although you could browse through the hundreds of distributions available at Distrowatch.com, we've spared you the trouble by curating a list of top distributions to help you find the perfect flavor for your unique palate of needs. Linux Mint provides a modern take on a classic desktop configuration. If you have ever used Windows XP, Vista or Windows 7 then you will appreciate that there is a panel at the bottom, a menu, a series of quick launch icons and a system tray. It is easy to install, comes with all the applications you need for general home computing and provides straight forward computing for the masses. Debian is one of the oldest Linux distributions and is the base for many of the other distributions including Ubuntu and Linux Mint. It is a community distribution and only ships with free software and free drivers. The Debian repositories offer thousands of applications and there are versions available for a large number of hardware devices. It isn't the easiest to install and there are various steps you need to go through post installation to get all of your hardware working, though. Purpose Community distribution that can be used as a server, general desktop operating system, base for other distribution. Truly multipurpose. Ubuntu is a modern desktop operating system designed for the masses and is meant to be every bit as easy to use as Windows or macOS. With full hardware integration and a complete set of applications, most beginners see this as the first step onto the Linux ladder. If you want to try something other than Windows and you are worried about Linux relying too much on the command line, try Ubuntu because you won't need the terminal window at all. Easy to install and easy to use with great support. Manjaro provides an easier method to install and uses an Arch-based distribution. Arch is a forward-thinking rolling distribution that many expert users swear by. However, Arch is somewhat less forgiving on new users and a level of expertise and a willingness to learn and read is required to get up and running. Manjaro bridges the gap by providing an operating system that intermediate users can use to get a taste of Arch without the hassle. It's relatively lightweight, which means it will work well on older hardware and machines with low resources. A great alternative to Ubuntu and other Debian based Linux distributions, openSUSE provides a stable environment for home users with a decent set of applications and a decent level of support. Installation can be a bit tricky for new or inexperienced computer users but once set up you'll have access to a decent set of documentation. Not quite as straightforward as Mint or Ubuntu, but a solid contender. Fedora is a community distribution based on Red Hat. Designed to be cutting edge, Fedora always comes with up-to-date software and drivers and was one of the first distributions to introduce both Wayland and SystemD. Straightforward to install and comes with a good range of software. Can be temperamental due to the fact that it is so cutting-edge and not all packages are stable. Zorin is based on Ubuntu and has been designed to look and feel like other operating systems such as Windows 7 and macOS. (The user chooses the theme to make it look like one thing or another). It features a complete set of desktop applications such as an office suite, graphics application, audio player, and a video player. Zorin also offers a lot of visual effects. Purpose General purpose desktop operating system designed to make users of other operating systems feel at home. Includes a lite version for older hardware. It is hard to believe that Elementary is so low in the rankings at the moment. Designed to be lightweight yet easy to install and use, with emphasis on a clean and elegant user interface. It is based on Ubuntu and so provides access to a large repository of applications. CentOS is another community distribution based on Red Hat but unlike Fedora it is more mainstream and built for the same sort of audience as openSUSE. It uses the same installer as Fedora and so it is straightforward to install and there is a decent selection of applications. Antergos, like Manjaro, aims to provide an operating system that anybody can use while also providing access to Arch Linux. It's not quite as polished as Manjaro but it offers the choice of six desktop environments and is fairly easy to use. The way you choose the desktop environment is during the installation stage and through the installer; likewise, choose all manner of features such as the applications you wish to install. Intermediate and expert Linux users swear by Arch. It provides up-to-date software and drivers but requires more maintenance than other distributions and it requires decent knowledge and a willingness to read the manual. PCLinuxOS is as easy to install and use as Ubuntu or Mint and has a great set of repositories and a good community. It is a rolling distribution, meaning that once it is installed you never need to upgrade it because it is always up to date. Solus is a fairly new distribution that focuses on providing quality over quantity. It uses the Budgie desktop, which is also new. This distribution is growing in popularity. Linux Lite is another Ubuntu-based operating system designed to be lightweight. It is easy to install and comes with a full suite of applications. It isn't an official Ubuntu spin off but it has been going for a number of years now and it is definitely worth checking out. As it is based on Ubuntu it is easy to install and use. Mageia rose from the flames of the Mandriva project when it briefly ceased to exist. It's a general-purpose distribution similar to openSUSE and Fedora with a good range of software and a simple to use installer. It presents a few quirks but nothing insurmountable. Before Ubuntu started using the Unity desktop it relied on the GNOME 2 desktop, which was a popular desktop environment both lightweight and customizable. The MATE desktop environment provides a desktop similar to the old GNOME 2 desktop although it uses GNOME 3. What you end up with is all the goodness of Ubuntu with a good performance and a highly customizable desktop environment. Lubuntu is a lightweight version of Ubuntu deploying the LXDE desktop environment. It comes with a full set of desktop applications but they aren't as fully featured as the ones you will find in the main Ubuntu operating system. 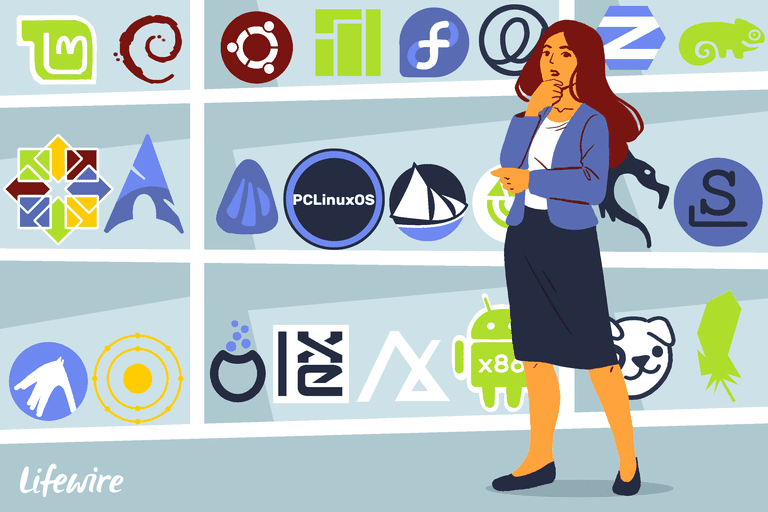 As Lubuntu provides access to the main Ubuntu repositories you can install any application that you really need to use. Perfect for older computers and netbooks. LXLE is a respin of Lubuntu with a more complete set of applications and tools included. The fact that LXLE is more popular than Lubuntu shows that the extras added do provide good value. Easy to install and great for older computers and netbooks. Puppy Linux is a superb Linux distribution designed to run from a USB drive with a very small download and memory footprint. Despite its small size Puppy includes a broad selection of applications. It is Android (you know, the one that is on your phone and tablet) but on your laptop or desktop computer. Easy to install but can be a nuisance to navigate and the applications are a little bit hit-and-miss. Run it in a virtual machine or on a spare computer. Not a mainstream desktop operating system. Slackware is one of the oldest Linux distributions still actively maintained and you will need considerable Linux knowledge in order to use it as it relies on an older approach to package management and requires a lot of manual tweaking to get things working. KDE Neon is a Ubuntu-based distribution that aims to provide a repository of all the latest software for the KDE desktop environment as it is released. Kali is a specialist Linux distribution built for security and penetration testing. It is based on the Debian test branch, which means it is fairly straightforward to install but the tools included require a certain amount of knowledge and expertise. AntiX is a lightweight general purpose distribution based on Debian with the IceWM desktop environment. It is fairly easy to install and there is a decent set of applications included by default, although not all of them are mainstream and well known. The performance is insanely good but to be that good the much of the visual ornamentation has been removed.